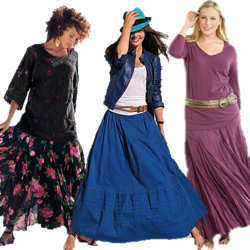 What's hot in Trendy Plus Size Skirts? Skirts are WAY in this season - long, short and in-between. Skirts this season will be long and flowing. Layers of sheer fabric and asymmetrical hems are very popular and fuller skirts are making a comeback. On the other end of the spectrum, shorter skirts (even mini-skirts) will also be very popular. I am also seeing a lot of knee length pencil skirts. Anything goes!